It is such a pleasure to feature the amazing Sara James in the next series of our video content designed to embolden more women to step into public life. This 4.43 sec video covers how this Emmy-award winning correspondent and anchor quells nerves during live TV. She shares skills we can all use. The number one thing is preparation. There have only been a few times when I’ve felt caught out and every time it’s because I haven’t prepared enough. Once you’re there, you need to remember that everyday you need to have that same enthusiasm you did the very first time you got that job. So I think it’s about preparation. I think it’s about taking those deep breaths, being calm and really just getting composed in the moment. And then, I really do think about what I was told at the beginning of my career by a wonderful co-anchor. He said, “you know you need to remember, that most people out there you’re speaking to already like you. They’re here; that’s how we are with each other. That was the greatest gift. I think we need to trust in our own story, our own narrative, and I think that’s so much a part of getting older. From what we wear, how we do our hair, all the things we tell our kids, actually really being in charge of our own narrative. Where are we going? What are we doing with this precious life we have? Not trying to be just like everybody else, that’s key. So when I’m out there, I’m thinking, ‘I’m here, this is my chance and I’m also really conscious I’m telling someone else’s story and I want to do the best job I can for them. Before moving to Australia in 2008, she was based in New York for more than a decade. She served as a substitute newsreader on NBC Today, was a frequent co-anchor of Weekend Today and often anchored MSNBC. She has received the U.S National Press Club award for her investigation of modern day slavery in Sudan, a New York Festival award for her report on the first woman considered for the US space program, and a coveted Emmy for her coverage of the shootings at Columbine High School. Her report’s on Australia’s Stolen Generation won the Overseas Press Club of America Citation for Excellence. Sara was also the first network reporter to travel to the bottom of the Atlantic to the site of the Titanic for the NBC Dateline/DIscover Channel special, Raising the Titanic. 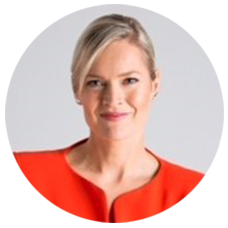 She has written two books, is a fantastic public speaker and lives in the Macedon Ranges with her husband and two daughters. Many thanks to filmmaker Paul Muir for this production. For women who want to take their business and online presence to another level. Please send me more info on elevating my business and presence online. Tagged in Australian journalist Sara James, Sara James.